This year, Umit Project was not accepted as a mentoring organization for Google Summer of Code as Google folks wanted to renew the participating organizations (several others like Fedora and PHP were turned down this year as we were). Even though, Adriano Marques is going to be a mentor for Nmap, mentoring projects related to Umit. 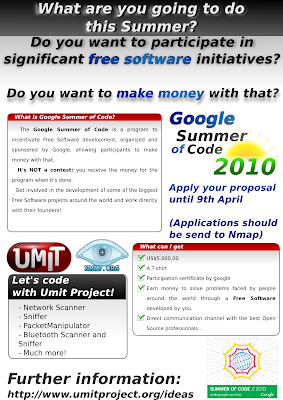 If you're willing to apply for Umit, do so by sending your proposal to Nmap and indicating that you would like to work for Umit. We invite all the community to join us this year in our endeavour to develop the best Open Source Network Monitoring Tools ever! Hurry! Applications deadline is April 9th! Help us spread the flyers! !